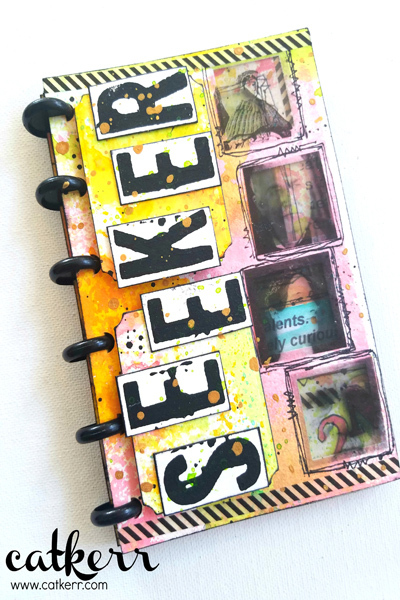 Project Description: Be a creativity seeker and experiment with Computer Grafix and additional mediums to create an inspiring mixed media art journal. On the notebook pages place the stencil down and add watermark ink through the stencil. Next, pour embossing powder over the image and remove the excess. Then heat the embossing powder with a heat gun. Continue this process on multiple pages with a variety of stencils. Add Art Spray to the Gel Press Plate then press the embossed page onto the plate picking up the color in random spots, repeat for multiple pages. Once the first color was dry add a second color and then a third. (The embossing powder acts a resist). You can also add color to blank pages without the embossing powder. Cut out a window in the pages that do not have the embossing powder. You can use a knife or die cutting machine. Print images on the Clear Computer Grafix then let dry. Once the film is dry cut out the image with a 1/4” extra diameter than the size of the window. Make sure to also, cut out a blank page of Clear Computer Grafix. Peel off the backing of the Clear Computer Grafix and place it on one side of the window. Next, remove the backing off the printed image and place it on the opposite side, adhere the two elements together. Add paint through a stencil to the pages with the window as well as adding black spatters and mark making. Print quotes that corresponding to the photos. Cut the quotes out and glue them on to the page and highlight with Art Crayon. On the embossed pages add a stamp with text and glue on a paper doll. Finish the page by adding a light layer of Art Crayon around the paper doll. The same technique was added to the cover but instead of cutting out one window add multiple windows with multiple images. Then add a little bit of dimension to the title and the page was done. Lastly, put the journal together by adding the discs.